The 49ers have signed defensive tackles Cedric Thornton and Will Sutton, as well as offensive lineman J.P. Flynn, the club announced today. In corresponding moves, San Francisco has cut defensive back Don Jones, offensive lineman Jamar McGloster, and defensive lineman Blaine Woodson. Of the players involved in today’s transactions, Thornton boasts the longest NFL track record. 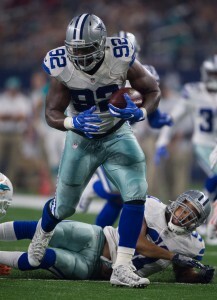 A former three-year starter for the Eagles, Thornton signed a four-year deal with the Cowboys prior to the 2016 campaign but lasted only a single season. He latched on with the Bills just before the 2017 season got underway and ultimately appeared in 15 games, playing on roughly a third of Buffalo’s defensive snaps. Sutton, meanwhile, is a former third-round pick of the Bears who flamed out after three seasons. Although he inked a deal with the Vikings last summer, Sutton didn’t make Minnesota’s initial 53-man roster and spent the rest of the year on the workout circuit. While he never did land a deal last year, Sutton is still only 26 years old. The 49ers aren’t hurting for depth along their interior defense, as starters DeForest Buckner and Earl Mitchell are backed up by Chris Jones, Sheldon Day, and others, while end Arik Armstead can also play inside. Still, Thornton and/or Sutton could have an outside chance to make San Francisco’s roster if they perform well during training camp.